Now try these various tie knots in just a few minutes with easy to follow steps. also called the Cross knot, as it seems to be tied upside down. 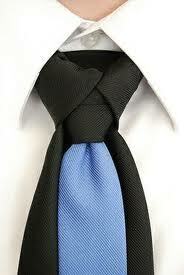 It differs from other knots by the fact that the narrow end of the tie is the leading end here. This tie knot is intended for any recreational activities, such as visiting a festive event, having a rest or after working hours. The tie is suited when it is made of plain thin and flexible material.This knot can be used both by men and women.